Life itself should never be the object of an unrequited love. We need moral acknowledgement, but it’s rare to come by. Most of us haven’t been paid for our virtues, and have lost the expectation of getting paid. What happiness and brotherhood can we expect under the daunting sneers of those who tell Man his desires are selfish, his senses invalid, his body feeble, his actions harmful and his destiny Hell? In this environment, the last thing healthy people want to confront is the subject of morality. The physical violations prohibited even in war are given no such protection on a spiritual level. Your spirit can live being shunned by the outside; it cannot live being shunned by the inside. If we hope for our spirits to survive, we need to look after ourselves. The Lonely Road Inside Us All. The motive of spiritual undercutting is bad enough, but worse is what it is responsible for: senseless guilt, irrational fears, anxiety, depression, physical incapacitation, emotional deadening and dependencies on others or the heavens which go unfulfilled, as lives go unlived. The pretense of brother-love is abound, but we know full well that none of it is true and that we are very much alone. The rejection of reality denies us the process of identification and leaves us in an unrealistic limbo. Some take drugs to mimic the emotional states that rational premises would have generated naturally, while others take drugs to counter the pain and emotional conflict caused by our irrational code. I can sense the heartbreak in those trapped whom I pass daily—in hallways, in streets, in traffic—souls and bodies stiffened and aged by pain. Life promised so much once, a glory that never came. But underneath that is a cry for help, a weakness that screams, “I’m capable of so much more than you see, help me to find what I missed and I’ll show you what I really am.” There is so much untapped potential out there it is astonishing. The freedom in their souls has been stifled in so many ways and from so many directions that they have lost the capacity to recognize it. But one thing is clear: they’re not enjoying life, and the problem is inside now. Missing the gratification of living is a tragedy played out by most of mankind. Drudgery becomes their medium which doesn’t stimulate creative thought, but lethargy, leading to more drudgery. No matter what they try, all roads seem to lead there. They remain down on themselves and down on life. If we’re not having fun, what’s the point? Life is only worth the effort if your spirit remains intact, meaning how you see the world, others and your possibilities. This is the most crucial human dilemma because life itself should never be the object of an unrequited love. I can see the dividing line which separates people from what they profess to seek in the statement, “Yeah, but.” I see the tail-chasing mistakes, the pointless stress, the efforts that lead nowhere and the minds slammed shut to any path that would provide relief. They know there is a problem, yet can take no steps in the direction of their fulfillment. Stuck in a loop provided by popular guidance, they are left with so delicate an esteem they’re easily shattered by a strong hand from either side. What happiness did they expect under the daunting sneers of those who tell Man his desires are selfish, his senses invalid, his body feeble, his actions harmful and his destiny Hell? With nowhere to turn, their feelings for life become conflicted. Any attempt to rise is blocked, stopped and thwarted, while they are encouraged by the plethora of mediocrity to coast downhill into degeneration. It is the nature of existence they end up damning as intended, while the code of the killers goes unquestioned. They learn not to expect justice, understanding or fulfillment; they learn to stand down, to know their place and to let go of their dreams. They come to believe that the only alternative in life is to feel torture, or to feel nothing. They expect pain as a result of any thought, so they shut off and disengage life, often never to be reached again. Most of us haven’t been paid for our virtues, and have lost the expectation of getting paid. You know what you should be recognized for; you inherently know what virtue is, and what is vice. You know what pride you have earned, and what contempt. But what you meet with in this introspective moment is more disturbing: nothing. You hear silence, see not a lasting glance of concern, approval or disapproval in your direction; not from Man, not from nature. The only response is the quiet, impersonal, unstoppable ticking of the secondhand on the clock facing you. You know how clearly the good you’ve done outweighs the bad, making it insignificant—and yet the world remains silent about both. You wouldn’t mind paying the price for errors; you don’t seek to hide. What you need is to pour out the beauty of your soul, but no one is there to see. They keep walking, paying no attention, and all that is left is loneliness, pain, heart break, rejection and hate. Often you conclude, “What’s the point of being moral? Nobody notices either way.” The truth is everyone notices, but they suffer the same barriers. In this environment, the last thing healthy people want to confront is the subject of morality; yet one of the most sacred forms of elation denied us is seeing our fellow men look upon our lives with the same pride we feel about it; to enjoy the common bond of our solemn dedication to progress, and to know in quiet serenity that their tribute is deserved. Instead when attention does come as in childhood, it is often in the form of torture. The pressure to conform to pretenses in society, schools and families is ridiculous. Ostracism for practicing virtue is a truly debilitating punishment, and few can survive it alone. The physical violations prohibited even in war are given no such protection on a spiritual level. We are slow tortured, and I can see why most don’t make it emotionally. The endurance of going on for years with nothing—no rewards outside of your own appreciation—with your reservoir of passion empty and only the stale residue of a memory—the awareness of how they loved you so much more when you were less—is tragically heartbreaking. 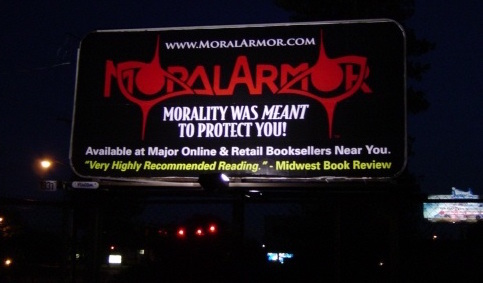 Moral Armor grew out of that emotional delicacy, a precious respect for justice and a moral sanction I expected from the world and never received, to confirm my life-furthering attributes and actions. Even without respect for the judgment of others, it’s very painful to feel the world doesn’t want you, knowing that your virtues are what they reject. But in this moral environment, you have to be prepared to go it alone—to go without rewards from the outside. Until the beast is broken, we are all condemned to some level of desolation as we advance, and no, moral clarity doesn’t make up for it. What is most important in the interim is that you know the true sum. Your spirit can live being shunned by the outside; it cannot live being shunned by the inside. You can bring into this world the highest image of Man now, or you can hold off for the social atmosphere that rewards strivers. But that could be decades. Why wait? Cry for an hour, but live for twenty-three. Do it for you.